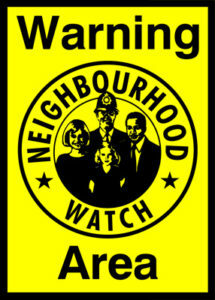 Neighbourhood Watch is a partnership between local communities, Police and local Policing & Community Safety Partnership. Its aim is to help people protect themselves and their property, and to reduce the fear of crime. Anyone can belong to a Neighbourhood Watch scheme and play a part in its achievements. Every community or neighbourhood can set up a scheme – a scheme can cover just one street, or part or all of an estate. 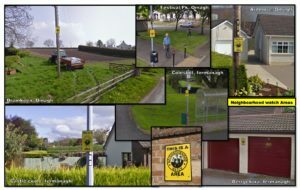 Everyone within a Neighbourhood Watch scheme plays an important part in making their neighbourhood a safer, more friendly and pleasant place to live. One of the most important things members do is to look out for activity in their neighbourhood that seems unusual or suspicious. When you belong to a Neighbourhood Watch scheme, you are given advice about the sort of things to look out for. Any information, no matter how minor, may help the police solve or prevent a crime. There is more to Neighbourhood Watch than protecting homes and property against burglary. By working together, neighbours can help to reduce all sorts of crimes, for example, antisocial behaviour and young people causing a nuisance. They can also take action to improve the environment by getting something done about vandalism, graffiti, poor street lighting and a lack of local facilities. 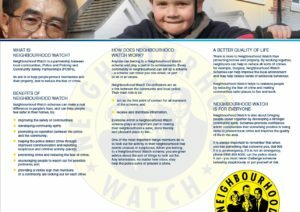 Neighbourhood Watch helps to reassure people by reducing the fear of crime and making communities safer places to live and work. 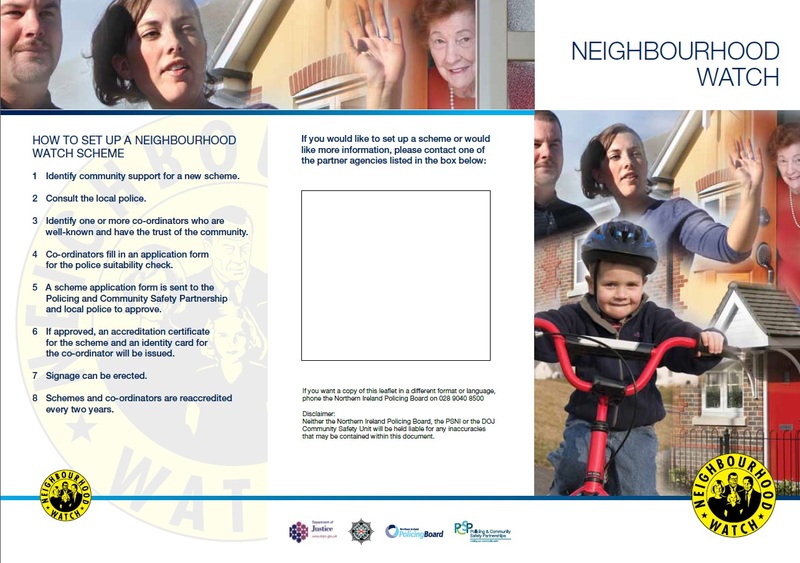 Neighbourhood Watch is also about bringing people closer together by developing a stronger community spirit. Schemes promote confidence within communities that something positive is being done to prevent local crime and improve the quality of life in the area. Identify community support for a new scheme. Identify one or more co-ordinators who are well-known and have the trust of the community. Co-ordinators fill in an application form for the police to approve. A scheme application form is sent to the Community Safety Partnership, District Policing Partnership and local police to approve. If approved, an accreditation certificate for the scheme and an identity card for the co-ordinator will be issued. Schemes and co-ordinators are reaccredited every two years.